here are a number of options when it comes to screensavers when a system is idle. However, nothing is more practical than having a clock with the help of which users can keep a track of their time. For this to be accomplished, the Free Digital Clock Screensaver is an ideal choice. As the name suggests, it is a tool that lets users have a digital display of the time on their screens and that too, for free. There are no hidden charges or sign ups required. Users can make the most of the features once it is downloaded and do not have to pay even a penny. There are many other interesting features of this app as well. It supports any PC or laptop that runs on Windows OS. There is no need to download any additional specifications as it is a standalone app. The display is attractive and there are a number of variations available when it comes to appearance and sound. The Free Digital Clock Screensaver is free from any viruses and hence, is safe for the device. It is a small sized tool that does not affect the performance of the system in any way. Another feature worth a mention is its graphical user interface. All the functions are laid out in a simple manner and anyone can comprehend them in the first instance. Once it is initiated, users first need to select a clock of their choice and the background color. When this is done, they can proceed to the sound effects and can add their own ones as well. 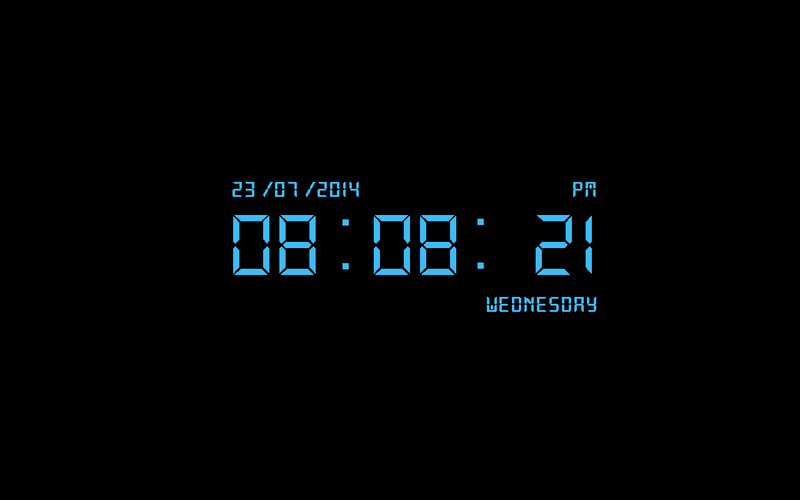 The next step is to set the time after which an idle system will display the clock. The Free Digital Clock Screensaver supports both 12 and 24 hours format and is highly commendable.